If we add or subtract two fractions with the same denominator, we can just add or subtract the top numbers. If we add or subtract two fractions with the same denominator, the denominator in the answer will be the same as the denominator in the question. 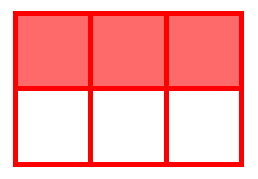 Let’s recap a little, below we have a fraction of a grid shaded in and what this means in terms of numbers. Here, the numerator is 3, and the denominator is 6. Because our two fractions have been split into the same amount, so is the answer, so the denominators stay the same! We have added 3 sixths and 2 sixths, to give us a total of 5 sixths. We can do the same with subtraction.